Rio de Janeiro (AFP) - Police in Brazil tear-gassed demonstrators and rioters burned buses in the violent conclusion of a general strike that shut down transport, schools and banks in protest against austerity reforms. 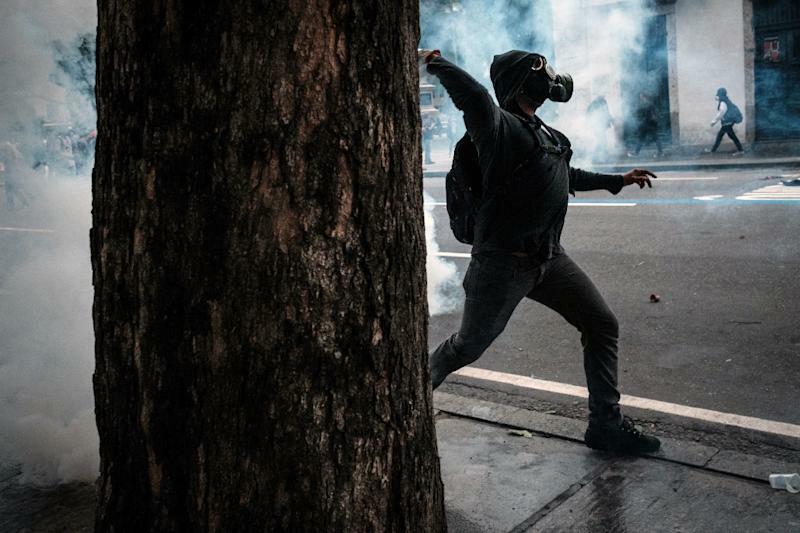 A peaceful protest by several thousand people in central Rio in the afternoon turned violent, with small groups smashing bank windows, erecting barricades and setting fires, including torching at least eight buses. Police responded with barrages of rubber bullets and tear gas, which floated through the avenues and up into the high windows of office buildings. 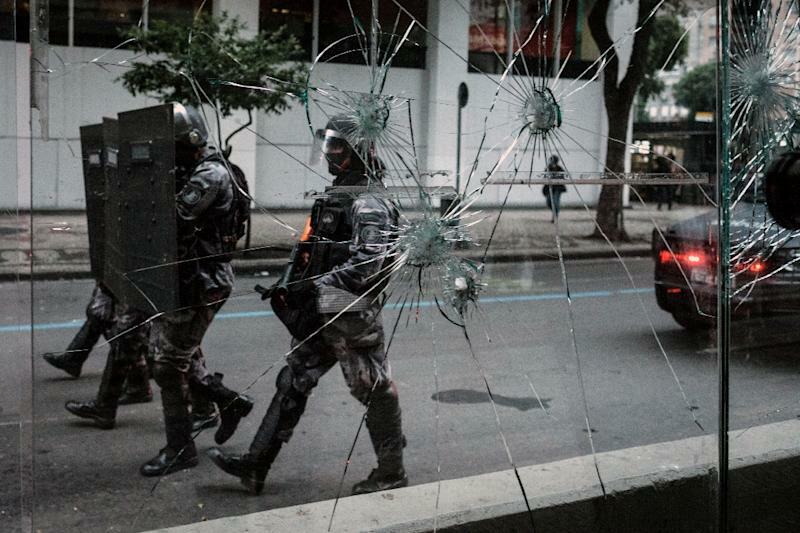 There were similar disturbances in Sao Paulo, the country's economic powerhouse. A crowd attempted to march to the private residence of President Michel Temer and clashed with police, who fired rubber bullets and stun grenades. As they retreated, the protesters hurled rocks, set fires, smashed street lamps and threw concrete blocks into the center of the avenue. 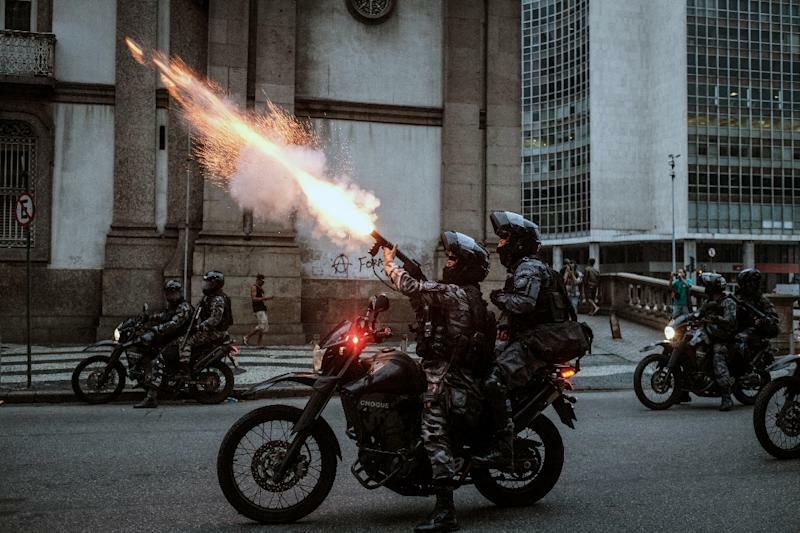 The ugly scenes came at the close of a day in which unions and leftwing groups managed to paralyze much of Brazil in protest at the reforms, especially a steep cut to the generous pension system. The metro systems in Sao Paulo, the capital Brasilia and Belo Horizonte, another major city, were shut down. Curitiba, where Brazil's huge "Operation Car Wash" anti-corruption investigation is based, was left without bus services, as was the big northeastern city of Recife, local media reported. The Forca Sindical union said 40 million people had responded to the call for the nationwide strike. This could not be independently verified. The strike came as government statistics on Friday showed unemployment has reached a record 13.7 percent, or more than 14 million people without jobs. "We can't keep quiet anymore with a government that isn't legitimate, which wasn't elected to dismantle the rights of workers," said Ricardo Jacques, a striking bank employee in Sao Paulo. However, Temer's center-right government says reforms are needed to save Latin America's biggest economy from further damage after more than two years of deep recession. In a statement, Temer criticized the "unfortunate and serious incidents" during the protests and the curtailing of "freedom of movement for citizens." The strike had the greatest effect in heavily unionized parts of the economy, including transportation, banks, schools, the post office and some hospital staff. The metallurgical workers' union said 60,000 members downed their tools. Although a spokesman for the National Civil Aviation Agency told AFP that operations at the airports are functioning normally, there were multiple reports of delayed and canceled flights. Temer has said Brazil's economy faces a meltdown without severe fiscal discipline and belt tightening. His most controversial measure has been to curb pension costs by raising the retirement age to 65 for men and 62 for women, up from the current 60 and 55. The government is also pushing for a liberalization of labor laws and has succeeded in getting Congress to pass a 20-year freeze on spending increases. Friday's strikes were one of the biggest protests to hit the Temer administration since he took over from impeached president Dilma Rousseff last August. Her predecessor and mentor, the former leftist president Luiz Inacio Lula da Silva, praised the strike, Valor Economico website said. "This is a clear demonstration that people are determined to paralyze (the country) in protest against the government's stripping away of their rights," the site quoted him as saying. But not all Brazilians agree. Marcelo Faisal, a landscape architect travelling from Sao Paulo to Rio, said "reforms need to take place" and that the general strike did not live up to the hype. "They didn't succeed in getting people to adhere to the strike, so they burned tires to block some points here and there, which just causes some disruption," he said. The economy shrank 3.8 percent in 2015 and is expected to have contracted a further 3.5 percent in 2016, the most painful recession on record. The miserable economic scenario is dovetailing with the country's worst corruption crisis in history. The "Car Wash" probe has uncovered a massive network of embezzlement and bribery at the heart of Brazil's economic and political elite. Eight of Temer's ministers are under investigation and the president himself has been accused of chairing a meeting in which his PMDB party negotiated a $40 million bribe from the Odebrecht engineering conglomerate. Temer and his allies deny any wrongdoing. Lula and a host of other leftist figures are also targets of anti-corruption prosecutors.